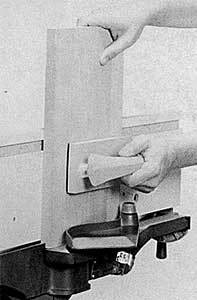 The jointer is designed to quickly and accurately accomplish many operations that would require many hours of tedious labor if done by hand. It's a rotary cutter that will plane edges smooth and square, ready for gluing or assembling. It will do a fine job on light surfacing cuts also, but should not be confused with the planer, as jointers often are. The planer is designed to dress stock to exact thicknesses and perfectly parallel surfaces. 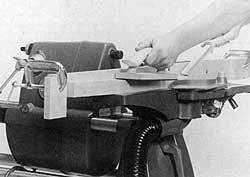 The jointer is used to square edges to surfaces and straighten surfaces. Figure 6-1. The Jointer can be mounted on (A) the MARK V or on (B) a Shopsmith Power Stand. The jointer mounts on the Mark V or a Shopsmith Power Stand (Figure 6-1). The dust chute will allow you to connect the hose from your dust collection system to the jointer. Since most heavy-duty dust collection systems have fairly strong motors, you should not plug a dust collection system into the same circuit as the Mark V.
The width of cut is a full 4". The depth of cut is adjustable from "0" to 3/8". The maximum depth of cut for most operations is 1/8". When surfacing, the maximum depth of cut is 1/16". You can make full use of the 3/8" depth of cut in stages when performing special operations. 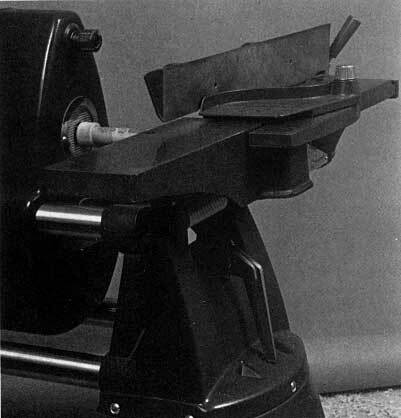 The infeed table is 5-5/8" wide by 13-1/4" long. The outfeed table is 4-1/2" wide by 13-5/16" long. Together, the overall table length is 28". The fence is 3" high and 21-3/4" long. It tilts 45� to either the left or right and has adjustable positive auto-stops at 45� right, 90�, and 45� left. It may be positioned anywhere over the cutterhead. Also, the fence has predrilled 1/4" holes, making it easy to add fence extensions to help support wide stock. The cutterhead is 2-1/2" in diameter, with three precision-ground steel knives. It's equipped with individual knife leveling screws so that you don't have to match-grind each knife. 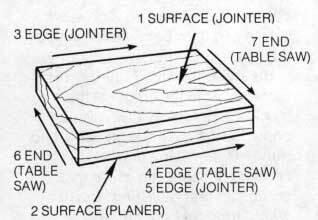 The jointer can make the cuts and joints shown in Figure 6-2. Figure 6-2. 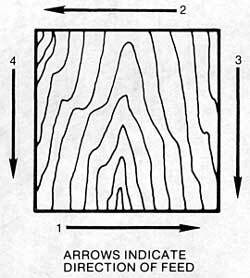 The cuts and shapes listed here can be formed on the jointer. (A) chamfer; (B) tenon; (C) bevel; (D) taper; (E) edge rabbet; (F) end rabbet; (G) surfacing (cut depth exaggerated for clarity); and (H) furniture let (example). Click on image for larger view. Never try to remove more than 1/8" at a time when edge jointing or 1/16" When surfacing. If you follow this rule, you'll get a much smoother cut and waste less wood. Most finishing cuts on the jointer are made with settings of 1/32" or less. The 3/8" maximum setting is used only for special operations such as rabbeting (even then the stock must be removed in several shallow cuts). When you set the depth of cut, always make your adjustment from a greater to a lesser depth. 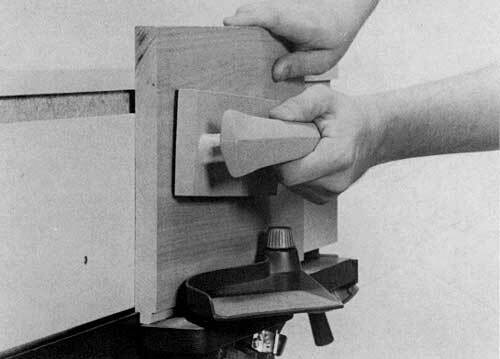 For instance, if the jointer is set to cut 1/16" deep, but you want it to cut 1/8" deep, turn the adjustment knob clockwise until the pointer goes past the 1/8" mark on the depth-of-cut scale. Then turn the knob counterclockwise until the pointer rests on the 1/8" mark. This maneuver takes up any "slack" in the depth-of-cut adjustment mechanism. 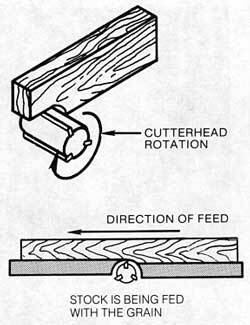 If you don't set the depth of cut from greater to lesser, there's a good chance the infeed table will move slightly during the pass and you'll get an uneven cut. Danger Zone-The jointer danger zone is 3" out from the cutterhead and knives and 8' directly in front of the cutterhead. When you use the jointer, stand to the left of the machine (opposite the drive shaft) and keep your hands away from the knives. Never remove the guards to increase the capacity. Use a push stick or push block to move stock past the cutterhead especially when the stock is lower than the top of the fence. Never remove more than 1/8" at a time when edge jointing or 1/16" when surfacing. Always lock the fence. If your jointer is mounted on the Mark V, secure the accessory mount lock, power plant lock and the eccentric mounting tubes. Never joint or surface stock less than 10" long or more than 4" wide, edge rabbet stock wider than 1", surface stock less than 1/4" thick or joint the end grain of stock less than 10 "wide. Never joint 'secondhand' lumber. You could be hit by pieces of nails, screws, etc. Also, never joint or surface painted or dirty wood, plywood, particle board or other hard materials. Support long stock with roller stand(s). Turn off the power before making any adjustment, tightening the accessory mount lock or clearing wood chips. If an unusual noise, vibration or uneven cut occurs, turn off the jointer and check the wedge locking screws immediately. When using the saw-jointer combination, make sure the upper and lower saw guards are mounted on the Mark V.
Knives that have been reground to less than 11/16" (.6875") wide should not be used. 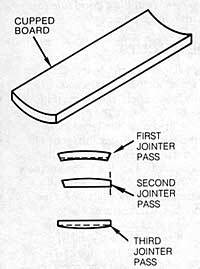 Use only Shopsmith Jointer knives in the Shopsmith Jointer. Other brands of knives are not wedge-shaped and will not seat properly in the cutterhead. Using other brands of knives is very dangerous. 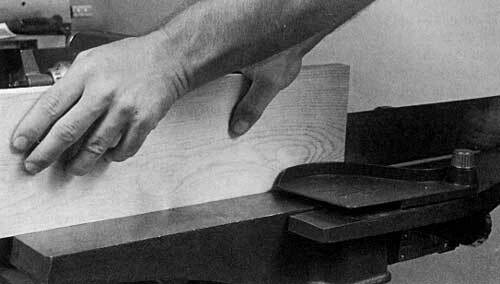 The deeper the cut or the harder the wood, the slower you should run the jointer. If the jointer runs too slow, you may get a rough cut, so you'll want to experiment with scrap until you can select the proper speed for the stock you're jointing. Note: These speeds are for 60 hz. operations. Because the Jointer mounts on the lower auxiliary spindle, the rpm is 1.6 times faster than for the upper auxiliary and main spindles. Figure 6-3. 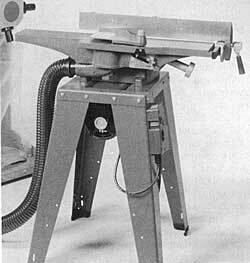 The jointer can be used in combination with the MARK V table saw. Warning: Be sure the upper and lower saw guards are in place. The Mark V was designed so that the table saw and the jointer can be used in combination (Figure 6-3). When the speed dial is set at "Saw-Joint," the power plant runs each tool at the proper speed. Warning: Be sure the upper and lower saw guards are mounted on the Mark V.
To square the edges, joint one edge of a board before beginning any sawing operation. This produces a smooth, straight edge to place against the rip fence and assures a straight, parallel cut. When you're ripping, cut the stock slightly oversize so that you can also joint the second edge. Figure 6-4. Always try to work so you are cutting with the grain of wood; when this isn't possible, make very light cuts, very slowly. Note: The depth of cut is exaggerated for clarity. 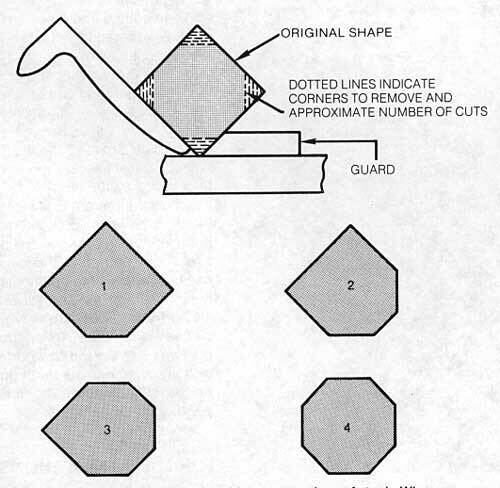 The edging cut is made by moving the stock so the knives will be cutting with the grain of the wood (Figure 6-4). Warning: Working against the grain seldom produces a satisfactory surface; it also increases the danger of kickback and splintering. If the cutting action is not smooth or if you feel the stock pushing back against your hands, the chances are that you are working against the grain. Stop the pass immediately and reverse the position of the stock. If you have to make a cut against the grain, take a very light cut and make the pass very, very slowly. Depth-of-cut settings on edge jointing cuts never should exceed 1/8". A setting of from 1/32" to 1/16" usually does the best job and wastes less wood. Figure 6-5. (A) Begin the cut using your left hand to steady the stock and your right hand to feed it forward. 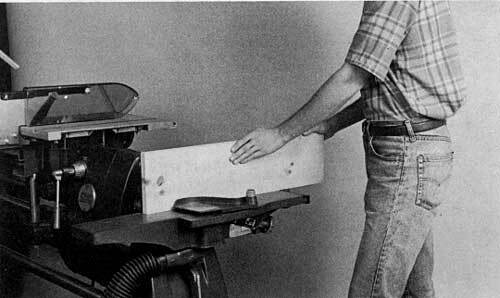 (B) As the stock nears the halfway point, reposition your left hand to the outfeed side of the jointer. (C) Continue to steady the stock with your left hand while you move your right hand to the outfeed table. Finish the cut by pushing the end of the stock past the cutterhead with both hands. Although the jointing cut is a smooth movement from start to finish, it may be thought of in the three steps shown in Figure 6-5. The better side of the stock is placed against the fence with the work edge down on the infeed table. Hands should be placed to hold the stock down on the table and snugly against the fence. The left hand holds the stock down 4" to 6" before the first bump on the top of the fence and guides the stock. This permits both side and down pressure to hold the stock firmly against the fence and flat on the table. The right hand is placed near the end of the stock and feeds the stock forward. Warning: If the stock is below the top of the fence, always use a push stick or push block to complete the pass. As the stock moves over the cutterhead, the guard moves aside to permit its passage. The left hand does most of the work of keeping the stock snug against the fence and down on the table, while the right hand moves it forward. Always try to keep hands hooked over the top of the stock. Warning: Do not allow your hands to pass directly over the cutterhead. At the end of the cut, the hands are still in about the same position on the stock. Avoid heavy downward pressure at the end of the cut, since this might tilt the stock into the cutter, resulting in a gouged end. Figure 6-6. When jointed boards are butted edge-to-edge, they should have these qualities. If the machine is properly ad-justed and the pass is made correctly, the jointed board will have edges that are square with its face. Edges of a group of jointed boards will fit against each other without gaps, checking out in all respects shown in Figure 6-6. Figure 6-7. The high fence extension provides extra support when you are jointing extra-wide stock. Wide boards that project sign ificantly above the top of the fence require careful handling so they won't tilt as you make the pass. The best way to joint extrawide stock is to equip the jointer with an extra-high (even extra-long) fence extension that you can bolt in place using the two holes that are in the fence. Jointing passes are then made in normal fashion but with extra support provided by the fence extension to keep the stock from tilting (Figure 6-7). Figure 6-8. 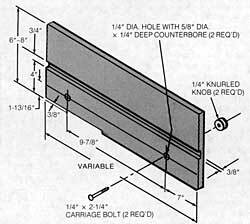 Construction details of a fence extension. Click on image for larger view. Figure 6-8 shows how the fence extension is made. The height may vary according to its intended use. For example, a high fence is very helpful for jointing wide boards because it makes it easier to be sure the face is flat on the fence, and the edge is therefore going to be cut square to the fence. Figure 6-9. 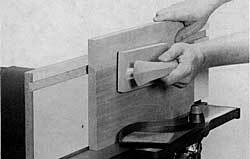 (A) The concave edge of a dished board can be straightened by making several light cuts. (B) When a board has an uneven edge, joint the opposite edge first. Next rip cut the uneven edge, then joint. Stock with knots, "wild grain," or extensive figuring is always difficult to joint; therefore, it requires extra care. For best results, feed the stock slowly and take very light cuts. Warning: Be especially cautious of kickbacks and stop cutting immediately if the stock will not feed smoothly. 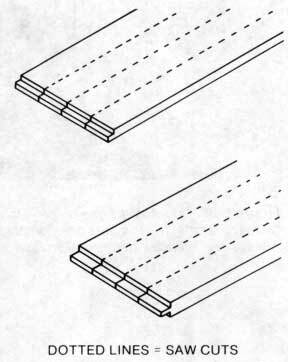 Whenever possible, stock that is distorted like the piece shown in Figure 6-9A should be jointed on the dished edge first. This is to provide adequate bearing surface for the jointing cuts that will produce one even edge so the stock may be ripped parallel on the table saw. 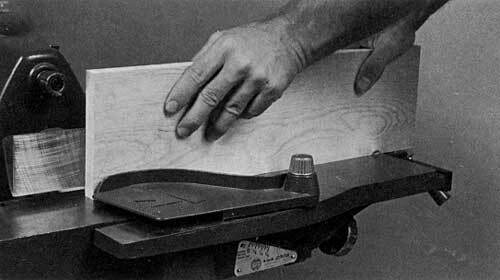 Warning: Use extra care when a curved edge must be jointed, since only a small area of the edge will bear on the table surface. The first pass will provide a flat area that will facilitate subsequent passes. 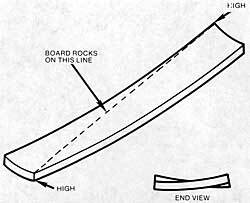 Stock having one uneven edge, as shown in Figure 6-9B, is handled by jointing the one straight edge first. 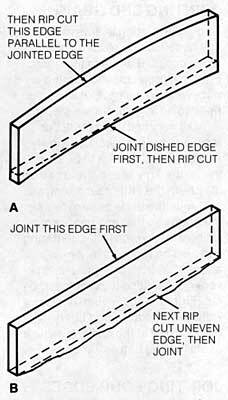 This edge rides against the rip fence and is rip cut to remove the uneven edge; then the rip cut edge is jointed. These guidelines apply to stock that has minor edge imperfections. Warning: Don't waste time on badly distorted material. It can be dangerous and you may not have much material left after the distorted areas are removed. It's a good rule to joint only good lumber. Figure 6-10.To reduce splintering, (A) make one pass to about this point; then (B) turn the stock end-for-edn and make a second pass until it meets the first one which, here, is indicated by the arrow. Note: The guard is removed and the depth of cut is exaggerated for clarity. Take very light cuts (1/32" or less) and feed the work as slowly as is practical. 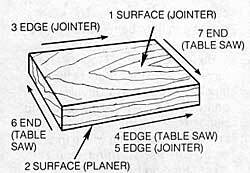 Check to be sure the jointer knives are sharp or they may burn the end grain during the cut. Joint the ends before jointing the edges so that any minor splintering will be removed. Splintering can also be reduced by jointing about 2" in from one side, then reversing the piece to complete the cut (Figure 6-10). You may also want to score the wood fibers at the very end of the cut with a chisel or utility knife before jointing. Figure 6-11. When all four edges of a piece of stock must be jointed, follow the pass sequence shown here. The final passes will remove the imperfections caused by cross-grain cutting. When four edges of a piece of stock are to be jointed, the operation may be done as shown in Figure 6-11. The first and second cuts-across the grain-can be accomplished with single passes; the third and fourth cuts-with the grain-will remove the slight imperfections resulting from the first two cross-grain cuts. Figure 6-12. A push block will help maintain even pressure, give better control over the stock, and keep your hands out of the danger zone. Surfacing-jointing the face of a piece of stock-is usually done for one of three reasons: to smooth up a rough surface, to thin down a workpiece, or to remove a warp. Always use extra care when you surface because the top of the work is below the top of the fence and your hands are close to the danger zone. Warning: Always use a push stick or push blocks to move the stock over the cutterhead. Never try to surface a piece of stock less than 12" long or 1/4" thick. If you need a smaller component for a project, do your jointer work on a larger piece and cut off what you need. The technique for handling and feeding the stock is similar to edge jointing. However, since the stock lies flat on the table below the top of the fence, always use a push stick or push blocks (Figure 6-12). They help you to maintain even pressure, give you better control over the stock, and help keep your hands out of the danger zone. As you get used to using a push stick and push blocks, you'll find they may actually improve your woodworking. 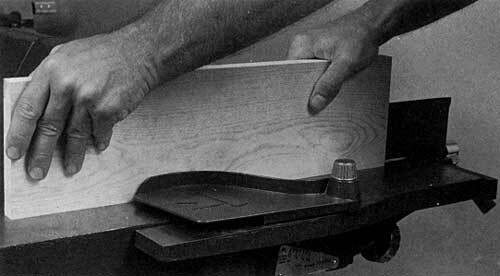 Since a push stick or a push block keeps your fingers safe, you feel more confident while making a cut. This confidence helps you achieve better control, and better control means a better cut. 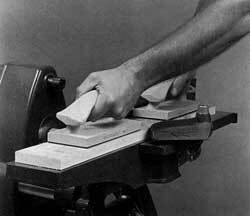 If you are using push blocks with sponge rubber bottoms, you may want to modify the hand movements when cutting. Use your left hand to position the push block about midway along the infeed table and move the push block forward with the stock while maintaining downward pressure. As the push block starts to enter the danger zone, stop the feed, bring the left hand back to its starting point, and then continue. With a little practice, these short movements can be made without affecting the quality of the cut. Figure 6-13. The seven steps and machines used to square up the six surfaces of a peice of stock. Figure 6-13 shows the sequence of cuts if a board must be squared on all six sides. First straighten one surface using the jointer, then plane the second surface parallel to the first using the planer. Then joint one edge to straighten it with the jointer depth set to remove no more than 1/16" per pass. 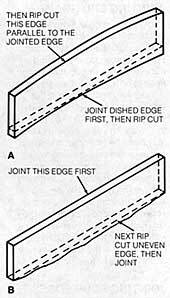 Place the jointed edge against the table saw rip fence. Rip to width plus 1/16". With the jointer set to remove 1/16" ,joint the sawn edge. Crosscut one end. Remove just enough to square up the end. Measure to length and crosscut the other end. Figure 6-14. Cupped boards, if they are narrow enough and the cup is not extreme, can be jointed in this manner. Boards with defects such as cupping or wind must have special attention if they are to be surfaced safely and with a minimum loss of stock. 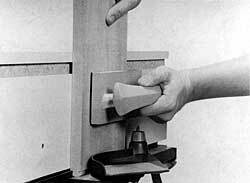 A cupped board is dished across its width as shown in Figure 6-14; its high points provide some bearing surface when the board is placed concave-side-down on the table (Figure 6-15). Keep the board as level as possible during the first pass; after that it will have a "flat" to provide bearing surface. Figure 6-15. The high points provide some bearing surface when the cupped board is placed concave-side down on the table. 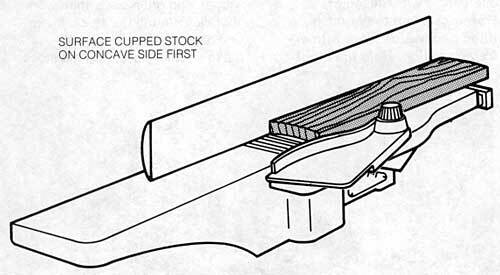 An optional procedure to use when the thickness of the stock permits is to resaw the stock after the jointer has established a flat surface for the rip fence. This will roughly surface the second side parallel to the first one. The saw marks can then be removed with a light surfacing cut. Figure 6-16. This type of distortion, called "wind," is indicated by a twist in the length of the stock. 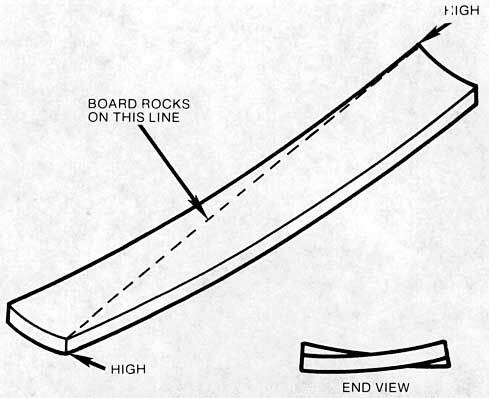 Boards with wind (Figure 6-16) have a twist in the length of the stock. The best way to level such a board is to mark the high spots and remove them in the first pass, creating flat spots on which the board can rest. Warning: Don't waste time on badly distorted material. It can be dangerous and you may not have much material left after the distorted areas are removed. It's a good rule to joint only good wood. Figure 6-17. Bevels are formed with the fence tilted over the knives. 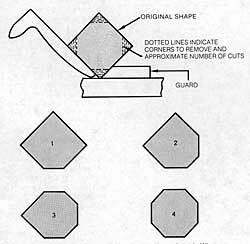 By tilting the jointer fence, you can make smooth, accurate angular cuts for a variety of projects (Figure 6-17). Be sure the machine is off; then push the fence lock handle in and unlock the fence tilt. Adjust the fence to the desired angle, and relock the fence securely. Whenever possible, work with a closed angle fence tilted over the knives, because it's easier to prevent slips and loss of control with this setup. Take shallow cuts with each pass. The face of the bevel will get wider with each cut; eventually reaching across the edge. However, if the stock is thick, the fence may have to be tilted backwards so it forms an open angle with the tables. Warning: When the fence is tilted backwards work with extreme caution. Hold the stock so it won't slide out from under your hands. Use push blocks to move the stock. 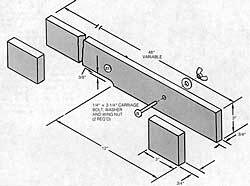 A chamfer is a bevel cut that does not remove the entire edge of the stock. Accomplish it by setting the fence to the angle desired (as you would for a bevel cut) and then making the number of passes required to shape the chamfer; that is, if you're cutting chamfers all the way around a workpiece, start with an end grain pass; then work your way around the stock. Make one pass; turn the stock 90�; and so on. Continue until the chamfer is as pronounced as you want it and you've made the same number of passes on all sides of the stock. This way each edge will be cut to the same depth and the chamfer will be even at all points. Figure 6-18. Octagons are formed by making repeat passes on all four corners of square stock. Octagons are formed by making bevel cuts on the four corners of a square piece of stock that has been sawn and jointed (Figure 6-18). Warning: If you work with the fence at an open angle, work with extreme caution. Use push blocks to move the stock. Make the cuts as diagrammed in Figure 6-19 to remove the corners of the square and form four new faces. When you must make more than one pass, don't change the depth of cut. Make the same number of passes on each corner. Figure 6-19. To form an octagon, start with a square piece of stock. When you must make more than one pass, don't change the depth-of-cut setting. Click on image for larger view. Figure 6-20. 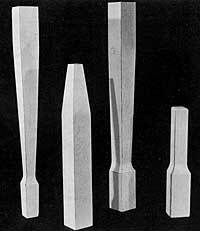 These are examples of forms you can produce by using the jointer for tapering. They can be used as legs for tables, chairs, and so on. 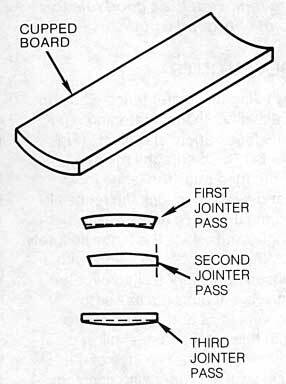 Special jointer techniques allow you to form tapers like those shown in Figure 6-20. Almost always, the procedure calls for a stop block that is used to position the stock for the start of the cut. The stop block can be clamped directly to the jointer fence. Use an extra-long fence extension with stop blocks like the one shown in Figure 6-21 when a tapered cut must start and stop on the stock being cut. The extension, which is diagrammed in Figure 6-22, is made long enough to provide extra support for the stock and the blocks are held in place with clamps so their position can be adjusted to suit the taper being cut. Figure 6-21. Tapering cuts are easier to do when you work with an extra-long fence extension that has its own stop blocks. To cut a taper that is, for example, 10" long and 1/4" deep, set the infeed table for a 1/4" depth of cut, and clamp the stop block 10" away from the topmost point of the knives' cutting circle. Brace the end of the stock against the stop block, pivot the guard, and then slowly lower the stock to make contact with the outfeed table. Turn the machine on. Use a push block and push stick to gradually feed the stock while you maintain contact between the stock and the infeed and outfeed tables. Figure 6-22. Construction details of a fence extension used for tapering. Click on image for larger view. Tapers that are longer than the infeed table must be handled differently. 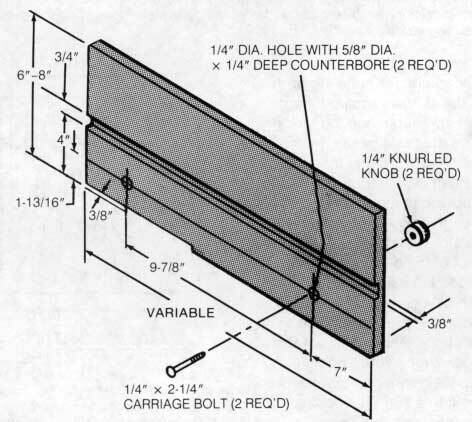 If, for example, the taper is to be 20" long and 1/4" deep on all four sides, mark the stock into two 10" divisions and set the depth of cut at 1/8". Place the stock so the line indicating the first 10" division is at the uppermost point of the knives' cutting circle and make two passes on all four sides. This will result in a taper 10" long and 1/4" deep. Reposition the stock at the 20" mark. Then make two passes on all four sides. You will then have a taper- 20" long and 1/4" deep. Figure 6-23. The width of the edge rabbet will be the distance from the outer corner of the knives to the fence. 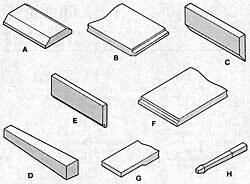 Edge rabbeting is the process of removing part of the thickness of the stock along an edge to produce a lip or tongue. 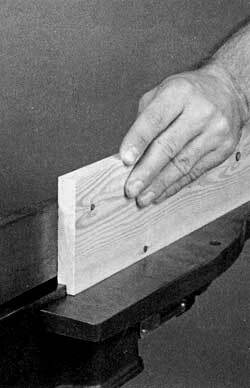 It's a fast and accurate way of making strong, interlocking corner joints or for recessing a panel into a frame. To set up to cut an edge rabbet, first unplug the machine. Check that the knives are evenly adjusted from side-to-side and that they extend 1/32" beyond the left side of the outfeed table. Warning: If the knives aren't properly positioned, the stock may not clear the side of the outfeed table when the cut is made. Pull the fence lock handle out, unlock the fence, and move it toward the left side of the table (away from the drive shaft). The width of the rabbet will be the distance from the outer corner of the knives to the fence (Figure 6-23). When you're satisfied that the setup is correct, lock the fence in place. Figure 6-24. Use the fence extension to provide support when cutting an end rabbet. 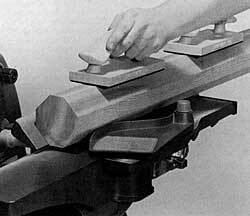 Your jointer will cut rabbets up to 3/8" deep, but never try to remove more than 1/8" of stock in a single pass. For deeper cuts, begin with the depth of cut set at 1/8"; then increase it after each pass. If you're making several rabbets to match, machine all pieces at each setting before changing the depth of cut. When cutting end rabbets (Figure 6-24), there is a tendency for wood to split out or splinter at the end of the cut. As with end grain jointing, splintering can be reduced by taking very light cuts and by feeding the stock more slowly. You can also use a utility knife or chisel to score the wood fibers before rabbeting. Figure 6-25. When you need rabbets, tongues, or tenons on narrow pieces, do the work on pieces of stock wide enough to be safely handled and then rip them on the table saw. Follow the pattern illustrated in Figure 6-25 when you need rabbets, tongues, or tenons on narrow stock. After using the jointer, use the table saw to rip the material into correct widths. Warning: Never try to rabbet stock which will have less than 10" of support against the tables and fence or a piece so narrow that your hands will cross into the danger zone. Figure 6-26. (A) A tongue or a tenon is formed on the edge of stock by making two rabbet cuts. (B) Tongues or tenons on the end of stock are done this way. Always use a fence extension to provide support. Tongues and tenons are made on the edge and end of stock in the same manner as that described in Edge Rabbeting. The difference is that the first cut is followed by a second one that is made after the stock has been turned around (Figure 6-26). The thickness of the tongue or tenon will be the stock thickness minus two times the width of the cut. Length, as in rabbeting, is controlled by the depth of cut. 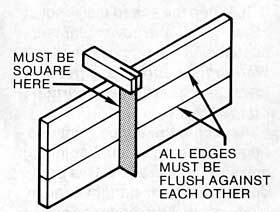 When a tongue or tenon is located across the end grain, you must use a fence extension for additional support. Chip out is a problem with end grain jointing, so you'll need to make light passes and form the tongues or tenons before jointing the edges of the stock.